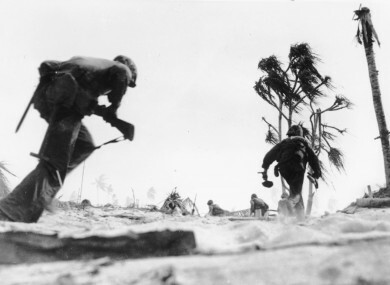 Noah, whose organisation worked with the US Defence Department on the project, said the men were killed during the Battle of Tarawa in 1943. “(They) had an expectation that if they were to die in the line of duty defending their country they would be brought home… that was a promise made 70 years ago that we felt should be kept,” he said. While the remains have not been formally identified, Noah said they almost certainly include those of Lieutenant Alexander Bonnyman, who posthumously received America’s highest military accolade, the Medal of Honour, for conspicuous gallantry. A statement on History Flight’s website said Bonnyman’s daughters had decided to have his remains interred in a family plot in Knoxville, Tennessee, next to his parents, with a public funeral service planned. Overall, more than 1,000 Americans died at Tarawa, while the entire Japanese garrison of 4,800 was wiped out. He said the bodies of several hundred American soldiers still lay in makeshift, unrecorded graves where they were buried after the battle. Noah said efforts would continue to ensure that the bodies were returned home. “There’s a lot of work to be done on the island,” he said. Email “Bodies of 36 US Marines found 70 years after they died”. Feedback on “Bodies of 36 US Marines found 70 years after they died”.